Are you searching for the CS Study Material? 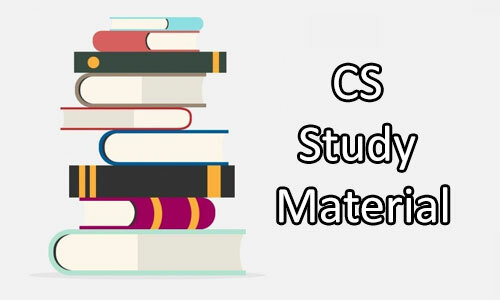 Here we are providing you with the best study material for your examination and this information will help you in your exam preparation of CS Foundation, inter and final courses. CS or Company secretary is a professional course. This professional course is managed by The Institute of Company Secretaries of India (ICSI). It is constituted under the company secretaries Act, 1980 to control and to grow the professional of company secretaries in India. To become a company secretary, a candidate must pass the foundation course, executive program and professional course. Intermediate and Final Examinations are conducted by institutes and to be eligible for the membership as a Company Secretary, the candidates have to undertake for practical training after completion of both Intermediate and final courses. The CS Foundation, inter and final courses Study Material is officially issued by the Institute of Company Secretaries of India (ICSI). CS course Study Materials are authored by expert faculties across India. These Study Materials are embedded with all the latest Amendments, Notifications and Circulars. The Study Materials issued by the ICSI are very important exam point of view. Study Materials are prepared in such a way that, students can prepare for the exams on their own. Here you can download the CS Foundation course syllabus by clicking on the given below links. Here you can download the CS Intermediate course syllabus by clicking on the given below links. The executive course new syllabus is divided into two modules. Here you can download the CS Professional course syllabus by clicking on the given below links. There are three modules containing 3 subjects in CS Professional course syllabus. The CS study materials are prepared by expert and experienced faculties across the India, so these are best choice for getting good result in your Company Secretary examinations. By following these study materials you can get the details like the pattern of questions asked in the previous examination, weightage of chapters in the syllabus etc. For you we are providing some preparation tips which you can follow and these tips will helpful in your examination preparation and to achieve best result. Plan your preparation and set dedicated time lines to each subject. If possible, prepare for two courses at a time, one theory and one practical. Make your own notes while preparing for the examinations. Mainly focus on conceptual understanding and co-relations among various topics. Practice speed writing and focus on good presentation of answers. Pick up the best prepared question to be answered first.